Yamaha Motor F425A Wins U.S. 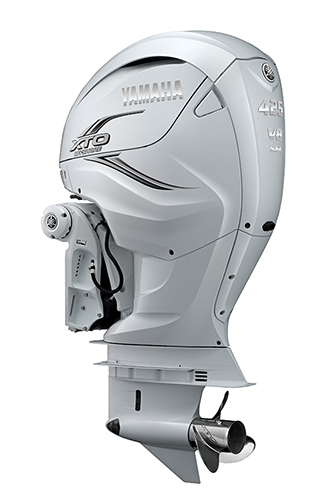 Innovation Award — Sixth Accolade in Total After F25G in 2017 — - News Releases | Yamaha Motor Co., Ltd.
IWATA, October 5, 2018—Yamaha Motor Co., Ltd. announced today that its F425A 4-stroke outboard motor (at 425 horsepower, the most powerful in the Yamaha lineup) has been honored with the IBEX® Innovation Award. 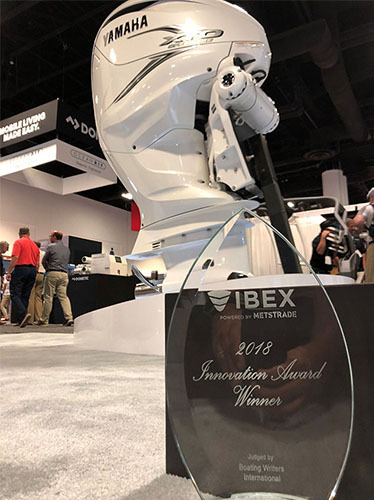 Presented during the IBEX® (International Boat Builders’ Exhibition & Conference) international marine trade show held in Tampa, Florida from October 2 to 4, 2018, this award is judged and announced annually and is comprised of 13 categories, such as Boatbuilding Methods & Materials, Mechanical Systems, and Outboard Engines. The Awards program is managed by the National Marine Manufacturers Association (NMMA®) and judging is carried out by members of Boating Writers International (BWI) selected for their outstanding specialist knowledge. Assessment is conducted based on various criteria, such as being groundbreaking compared to existing products, providing benefits to the marine industry and consumers, being practical, and being highly cost efficient. The highest-output model in the lineup, the F425A is powered by a newly-developed 4-stroke 5,559cm3 V8 engine which delivers a maximum of 425 horsepower. This power unit features the first applications in a 4-stroke outboard motor of direct injection technology, which sprays fuel at high pressure and high precision directly into each combustion chamber rather than the intake track, as well as the Integrated Electric Steering System, which eliminates the need for linkages or hydraulic lines. Combined with the Helm Master® joystick control interface and the CL7TM 7-inch color touchscreen, the F425A also provides high operational convenience. After its launch in North America from August 2018, the F425A is planned to be progressively released in other major markets such as Europe, Australia, and Japan. Following the NMMA® Innovation Award received by the F25G outboard motor in 2017, the F425A's accolade represents the sixth Award in total received by Yamaha Motor, and signifies how highly rated the F425A's groundbreaking technology is in the U.S.A., the leading marine market.